SEVAI – Society for Education Village Action and Improvement a acclaimed NGO of repute at Tiruchirapalli and surrounding Districts for the past 42 years has entered into an joint venture with Railway Children to implement a project Children in Contact with Railway Stations from December 2017. As a part of this noble endeavor a round-the-clock Child Assistance Booth has been inaugurated by the Deputy General Manager of Southern Railways at Trichy Railway Junction. The CCRS project has achieved rescue of 550 children and follow up of children including Home Visits between January and August 2018. The different categories of children rescued so far include Runaway children, addicted, child labour, abused, familial disputes, etc. The objective of this project is to prevent trafficking and to prevent violence against children to strengthen the protection services available for children in vulnerable situations. It is a joint initiative of SEVAI; a Trichy based NGO and Railway Children India, with Financial support and co implementation support from Railway Children India. 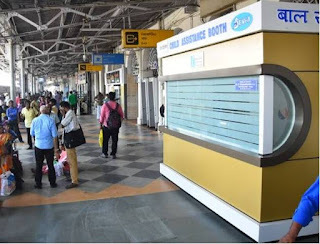 The Child Assistance booth has been set up in Platform No.1 of Trichy Railway Junction which happens to be one of the significant Railway Junctions in Southern Railways and also serves as a hub between Southern and Northern parts of India. Tamilnadu under the JJ Act. The open shelter for children operated jointly by SEVAI and RCI is situated near central bus stand. After the children reach this Open shelter the staff members provide the children services like Counseling, Non- formal education, Engagement in games and boarding and lodging facilities till they are produce before CWC for further procedures. A Human Capital of 13 members have been exclusively appointed to take care of children arriving at SEVAI-RCI Open Shelter. Most of the children are comfortable, feel at home in the Open Shelter environment, and have expressed their interest and willingness to extend their stay at our SEVAI-RCI Open Shelter to our staff.